One of the things I miss from Venezuela is fresh fruit juices. I am not just talking about OJ, but the full range of fruits available all year round. Jugos naturales are available at almost every corner in most establishments that serve food either to eat in or take out. In Venezuela the juices are prepared by blending fruit chunks at high speed with ice, and a small amount of water or milk, we call the later ones batidos (shakes). We Venezuelans tend to have a sweet tooth, so most people also add some sugar, I prefer mine without. The list of fruit juices available any one day is always as long as the list of fruits in season, some as exotic as guava, mango, soursop, passion fruit, and also some more familiar as cantaloupe and watermelon. There are some juices made by mixing two or three fruits and/or vegetables that are known to give you extra vitamins, energy and vitality. “Tres En Uno”, the name of the popular lubricant “3 in 1” which also claims miraculous results, usually identifies a juice made with beets, carrots and orange. At home on Long Island, and specially in the summer we make and drink a lot of natural fruit juices. We find them to be not only delicious but also very refreshing. 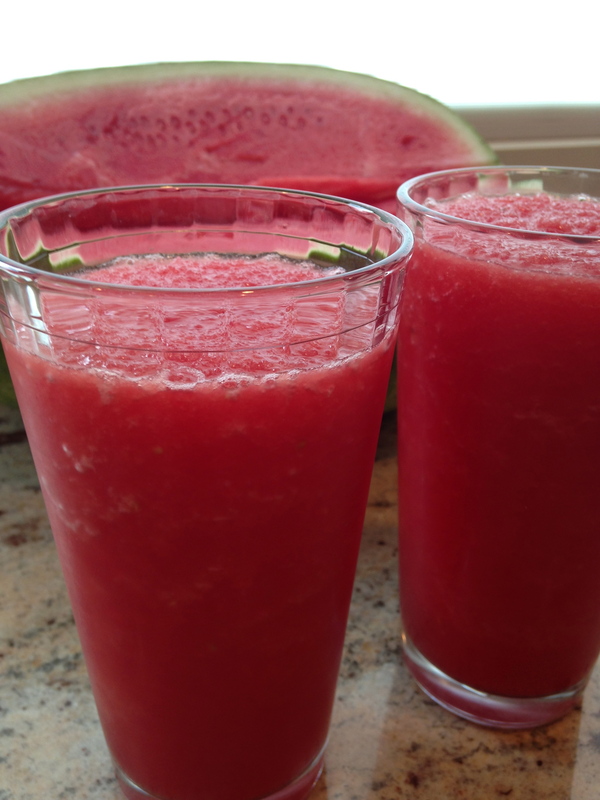 One of our favorite juices is watermelon. Nothing really compares to watermelon juice when you are terribly overheated. 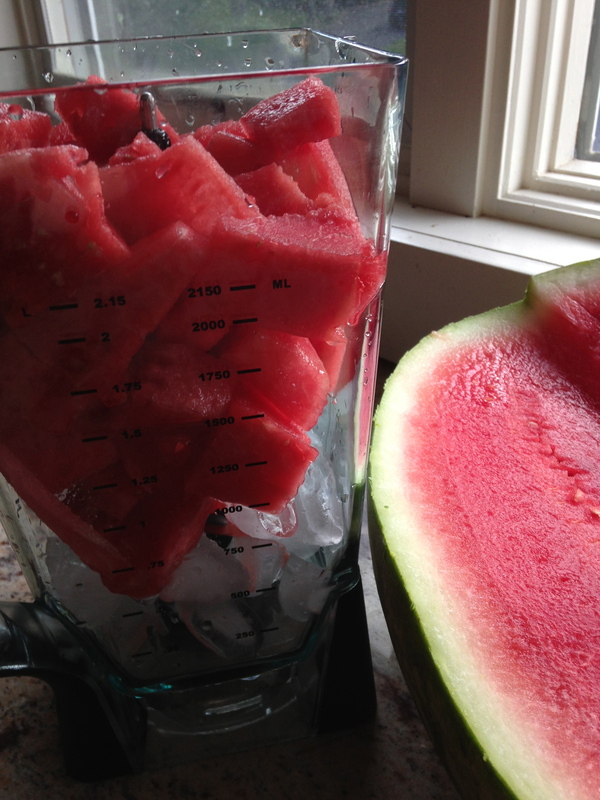 The recipe and instructions are simple: chilled watermelon chunks, ice, blend and serve. If using the seeded variety, you may want to strain the juice before blending it with ice. The best thing is that this recipe can be repeated with any fruit you like, just remember to add a little bit of water (or milk) to most other fruit. I also like to experiment with my own versions of “Tres En Uno” juices by combining whatever fruit I have on hand at home. I even use frozen strawberries or blueberries to add to my special mixes. 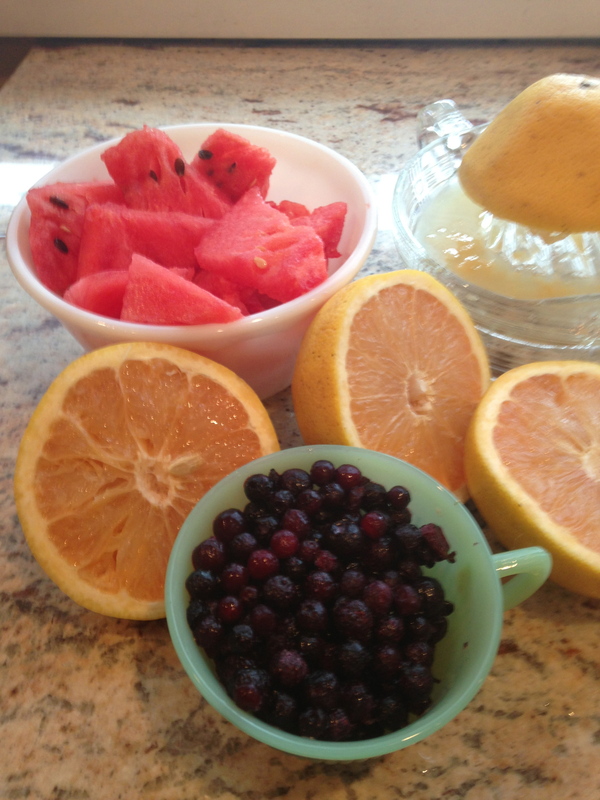 Last week I made a delicious grapefruit/watermelon/blueberry which we had during breakfast. Be creative, this is a nice way to beat the heat. Try mixing 1 apple, 3 or 4 carrots and a little chunk of fresh ginger. Use the juice extractor, it is best (one glass). Or a kiwi (blender), frozen strawberries and one apple again. The apples should always be “pressed” in the juice extractor and then mixed with the other ingredients that has been blended. By juice extractor you mean a power juicer?